With the Driver, I noticed how long my hands were on the plane once they touched it coming down from the top, and never left it until impact. 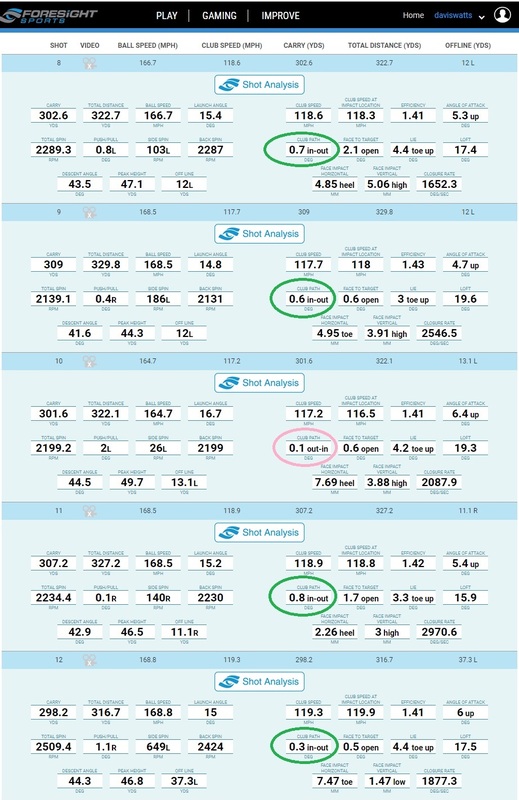 I took a 7 iron swing from down the line, shot on the same day as the Driver clip, and it seems I was swinging pretty well, because you’ll see the same thing with the iron shot – my hands never leave the shaft impact plane line and the club was perfectly on plane from the top to impact! This is the result of having performed my address setup with the proper “address measuring” procedure, as laid out in the “E = MCS” video and then having tightened my pivot from what I’ve been doing for years. I used to really jack the hands and club up at the top, which would lead to plane issues coming down, however well I might be striking the ball, and you don’t want a steep plane because of the timing required to actually strike the ball well – when you’re “off,” things can get ugly pretty quickly. … it’s pretty difficult to do much wrong. In the first frame is where my hands touched the plane line coming down, and they stayed on that plane line all the way down through impact, as you can see in the gif. above. And if you’re looking like that coming down, then all you really have to worry about is if you’re aligned on the proper target line, and if your club face is square at impact. Both of those would be taken care of by setting up in the prescribed MCS method, and of course, if you have the optimal “neutral” grip, then you should go from square face at address back to square at impact! The fun thing for me? My swing wasn’t anywhere near what I’d call “perfect,” with these swings. But that’s the beauty of MCS – the more you work on the principles, the better your swing will get. 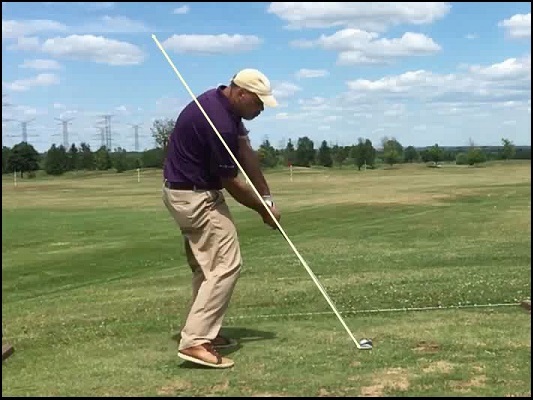 Everything that is in the MCS Golf Swing model should allow anyone to swing in the same method. Performing the proper transition with the “Pressure Plate” concept to again use the hips & legs to engage the Primary or 1st Lever, leveraging the hands and club to the “3 O’Clock” position (the “Drop”) and then down through impact (the “Pop” in the “Drop & Pop”). … and you’ll know the feeling of a mechanically-sound and properly-executed iron swing! If you like that, I’m pretty confident that the work I’ve done looking at pivot tightness and exactly how to get your pivot the tightest, will have me swinging much better than even what I was doing this past summer. And all of this is accomplished without compensating or making adjustments to natural motion – the better your setup and pivot, the less hand-coordination you’ll need to make good swings & the more you can just swing and relish the results.